Included in the collections at the Jimmy Carter Presidential Library & Museum are many gifts that the President and First Lady received during Carter's 1977-1981 administration, The Crown of St. Stephen included...kind of, that is. 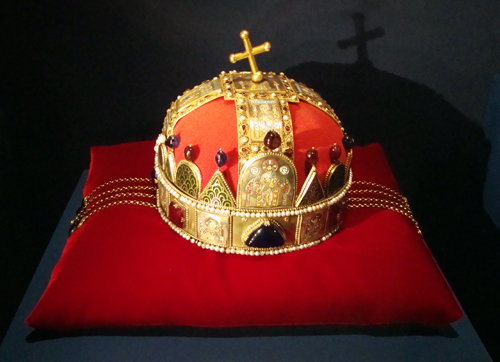 "For centuries, the Crown of St. Stephen was the sacred symbol of Hungarian political authority. At the end of World War II, U.S. Army officers agreed to take the crown to prevent it from falling into the hands of the Soviet army. For many years, Cold War tensions prevented the return of the crown to the communist government of Hungary. In 1977, President Jimmy Carter decided the time was right, and the crown's return led to the marked improvement of U.S.- Hungarian relations...On March, 18, 1998, this special reproduction of the crown was presented to Jimmy Carter by His Excellency Árpád Gōnez, the President of the Republic of Hungary."